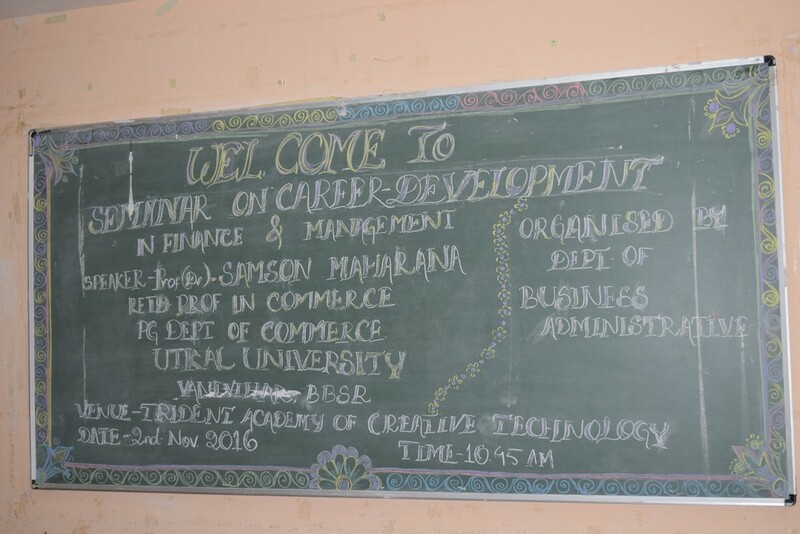 Topic of Seminar: Career Development in Management and Finance. Resource Person: Prof (Dr) Samson Maharana, Retd Prof in Commerce. Participants: MBA 1st Yr and BBA Final Yr Students. Proceedings of Seminar: Seminar was started with welcome speech by Prof(Dr) Ashok kumar Rath. Prof Maharana, the resource person highlighted on Present Economic condition of the nation and its impact on the corporate sector as well as on employment of the professionals. He elaborated the Finance sector, banking sector and some renowned companies like TATA and Reliance Industries. He discussed Warren Buffet and Bill Gates and how they have occupied their position among the richest people of world. At last Prof Maharana discussed about the future prospects of the students taking finance specialization in MBA program. At the end of the seminar there was a question answer session in which the participants interacted with the resource person on many aspects of the topic of the seminar. Outcome of the seminar: It made students aware of the present economic scenario of the country and its impact on the professional education and job. The seminar was highly appreciated by the students with a request to conduct such type of seminars in every week.